A man falls in love with his waitress at a Chinese restaurant, and they live happily ever after as champion pitmasters. That’s the American Dream, right? Well for Chad and Nicole Backerman, it’s reality. After receiving a smoker as a wedding gift from Nicole’s father, this husband and wife duo out of Carthage, Missouri, were destined to be a BBQ greatness. The smoker was meant to be a way to feed Chad and Nicole’s softball team, but they were inspired to put it to use in a completely different competitive arena. So how do you craft a signature championship-level style in a small town in Missouri? According to Chad, their location is what makes them unique. Carthage is about two hours from just about everywhere. Kansas City, Arkansas, Oklahoma, and Memphis. When you’re that close to all the major BBQ hubs, it’s easy to pick and choose the best of all worlds. Chad and Nicole’s style truly shines through in the chicken category. Chad, an engineer by day, has perfected an intricate process that keeps their chicken consistently delicious, every time it makes it to the judges’ table. 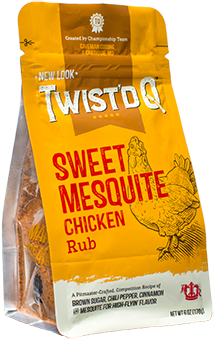 Their chicken is so delicious, in fact, that Twist’d Q™ reached out to Chad and Nicole to partner up on a chicken rub. The result was the Sweet Mesquite Chicken Rub, a balanced rub with just a right amount of sweet and heat. Once the rub is applies, the chicken is cooked and Chad has done his thing on the technical side, Nicole swoops in to add the finishing touches and select the pieces that are fit to submit. It’s not just Chad and Nicole’s teamwork that makes BBQ a family affair for the Backermans. Their two sons are competitive BBQers as well. “They love it,” says Nicole. “They’re finally in separate age divisions so they aren’t competing against each other anymore.” The boys specialize in ribeyes and hot wings, and have both taken Grand Champion in their last two competitions. Not bad for a 12- and nine-year-old. Chad and Nicole have come a long way since that first smoker. It’s since been retired, but Chad has built plenty of successors with his own bare hands. In fact, they’ve never competed with a commercially made pit. That’s a nice reminder that you don’t need to go out and spend your life savings on equipment to make good BBQ. All you need is a fire and some meat.